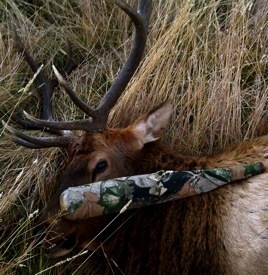 Elk Calling Tips - Bugles DO work! Hello Elk Hunters and Sportsman alike! So many times I run into hunters that are not comfortable with bugling Elk and swear up and down that bugling is a bad idea and they pull out their trusted cow call. This is one of the most common mistakes a hunter can make. Now I am not saying that a cow call is not a good thing or that there ARE times that you should only use a cow call, because there absolutely are! What I am saying is there are times to make that beautiful sound come out of the end of your bugle and speak to the Bull Elk out there the ways the other Bulls talk to them. at him and he would let some sound go that sounded almost like a bugle. This went on for about 5 minutes until I decided I had played enough. I decided to back out so the hunter would think he just spooked the bull. I started walking up the hill and in about two minutes I had a bull explode when he hit my sent! It was no horrible hunter at all; it was a young 4×4 bull that was just getting his pipes going for the year. I wish I could say that was the first time that happened, but it wasn’t. The second tip that comes from that story is to call and then be silent for a few minutes. I called back and forth with that bull for 5 minutes; however, within 2 minutes of me shutting up he came right in. That also has happened more then once for me. The third tip for calling in Bull Elk is to try to match the Bulls you hear. If the Bulls I am calling are not screaming at me, I will tone it down a little. If they are not chuckling a lot, I too will not chuckle a lot. Sometimes I will actually try to chuckle the exact same way they are chuckling and they seem to respond nicely to that. The one thing you will risk with bugling aggressively is scaring the bull away, especially if he has cows. When a bull has cows with him, lean greatly on your cow call. When you can get a bull excited listening to your cow call he will want to add you to his heard, when you can hear him getting excited and calling back to your cow call, slip in a passive bugle, he will be hungry to come in to whoop that satellite bull and take that cow! I did that once and it sounded like he was tearing down the forest to get to me! EXCITING! Lastly, if you are hunting with hunting partner and they are calling for you and you have a bull hung up and he just will not come in, have your caller slowly move down the mountain and keep calling. The bull at times will come in to where you were calling to see if any cows stayed behind because he thinks he scared you away. You will be there awaiting his final mistake! I hope you found this blog helpful! Comments for Elk Calling Tips - Bugles DO work! Saskatchewanhunts.ca loved the article. I will be back to read more tips and tactics. Keep up the good work. You can find Matthew's Pro Bugles website at www.probugles.com.